Nikki Miller, M.S.N. 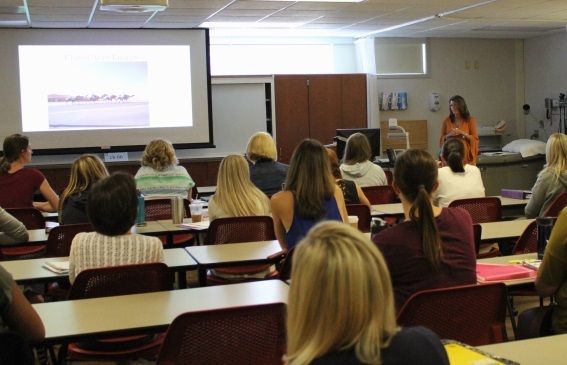 '13, right, was recently a guest speaker for Professor Denise Wilson’s FNP classes. Miller is one of the first nurse practitioners (NPs) to be hired in the Middle East. Nikki Miller ’03, M.S.N. ’13, has a passion for nursing and for helping people in other countries to receive needed care. Her varied educational and practice experiences have led her to being one of the first nurse practitioners in the Middle East. In 2003, Miller graduated from Illinois State University’s political science program and spent 12 years as an international flight attendant. Through this profession, Miller saw some horrific conditions, and knew she wanted to overcome her fears and work with people from areas of the world most have forgotten about. “I wanted to help those who didn’t have access to medicine no matter how little I could do. I was hoping that I could obtain the knowledge and skills as a nurse to eventually travel the world and apply my skills in areas of need,” Miller said. That is when Miller decided to pursue a nursing career. She completed her B.S.N. from Methodist College of Nursing. Miller’s career as a RN was spent entirely as a trauma nurse at Advocate BroMenn Medical Center. While working at Advocate BroMenn, several of Miller’s co-workers had attended the Family Nurse Practitioner program (FNP) at Illinois State University’s Mennonite College of Nursing. “They spoke highly of the curriculum and instructors. After looking at several programs, I felt that it fit my lifestyle the best,” Miller said. Miller graduated from the FNP program herself in 2013. Miller’s husband is an airline pilot, and in 2014 was relocated to the United Arab Emirates (UAE). At that time, the country did not recognize nurse practitioners. “I had a very hard decision to make, relocate with him or stay behind and gain some experience. At the time I chose to stay behind,” Miller said. 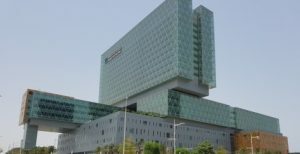 In 2015, the UAE health authority, working in conjunction with Cleveland Clinic Abu Dhabi (CCAD), agreed to recognize and allow the use of Nurse Practitioners only at the CCAD campus. This was Miller’s opportunity—and passion—to help a developing country obtain quality healthcare as well as learn more about diverse populations and the diseases that affect other parts of the world. Since that time, the clinic has gained one more NP in cardiology and will have one more NP working in the ER later this year. In August, Miller assisted in the opening of the Fast Track area of the ER. “In time, we hope to staff this area completely with NPs,” Miller said. The physician group is mostly Western trained, and the nursing staff is very diverse from countries all over the world. Adjusting to life in another country wasn’t that difficult for Miller. It is very common to see camels on the side of the roads in Abu Dhabi. 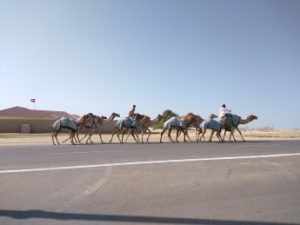 There are a variety of activities in the area, such as boating, renting jet skis, festivals, and camel races … after all, this is the desert! Sand storms are common in the area. The temperature averages 110 degrees each day with humidity at least 50 percent. Miller also raves about the food. “One of my favorite things about the area is the fresh dates. There are palm trees everywhere and dates are plentiful. You are free to stop along the road and pick them as you like,” Miller said. Living in another country has not stopped Miller from continuing her education. She is currently enrolled in the D.N.P. program at Vanderbilt University. She feels that continuing one’s education is key to being a successful caregiver. Miller’s husband will retire from Etihad Airways in 2023, but they haven’t decided what their next adventure will be. Miller presenting to the Pathophysiology class in the Nursing Simulation Lab. 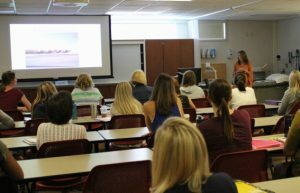 In August, Miller returned to the states and contacted Professor Denise Wilson to see if she could visit with some of the FNP classes. She gave presentations to two classes, and talked about her journey.